As I mentioned in the last blog, RAW TV had got in touch to ask if we’d be interested in being part of a programme which had a working title of “Miracle Weddings”. Personally I hadn’t considered our wedding exceptional. Many of my friends have met their partners since becoming disabled, so it had just become normal to me. Charlotte, the Producer, had read the blogs and felt that the circumstances behind our meeting, and the difficulties that we faced would make an interesting story for their documentary which would be aired on ITV. She travelled down from London to meet us and to discuss the programme. We agreed! It wasn’t just the wedding that they wanted to film, it was also a real insight into our lives, and what living with a high level spinal injury meant. The first block of filming was 3 days, including interviews, transferring in and out of chairs, on and off the bed, in and out of the car, getting dressed, washing, shaving, driving, so much I can’t even remember. It was a lot of work, but the team that Charlotte brought with her were great fun, interesting, and sensitive people. We didn’t mind doing everything that they asked us to do, and the retakes. In order to get the lighting right, they put a silver mesh over the front of the house; the neighbours must have wondered what on earth was going on, and we couldn’t say too much. A very unsubtle crystal meth factory in the Cotswolds? The driving scene was great fun to do, I felt like a top gear presenter. A camera was fixed to the bonnet of the car facing in, and another small camera inside. Just after everything was set up and I was in the car, the heavens opened. After 30 minutes we decided to give up and come inside to film something else while we were waiting. Eventually we did get a break in the weather and set everything up on the car again. It’s not all glamour being on TV. I had to follow the TV crew who could see what was being filmed from the van in front. Charlotte was hiding behind the seats of the car, telling me what to do and asking me questions. Everything was being picked up on the microphones that we had taped to us. It had been raining quite heavily, and the route that they had chosen took us through a flood underneath a bridge. So they could get the footage they wanted we went round four times. As sailing is a big part of our lives, particularly mine, they wanted to film me in action doing that. Go pros were fitted to the deck and the gunwales to capture the action both forwards, and backwards. 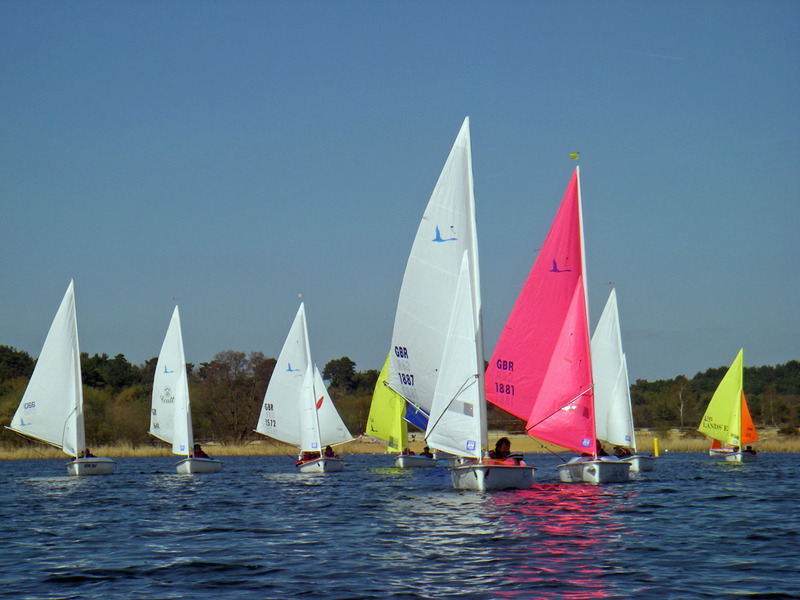 The Commodore of Whitefriars Sailing Club had also been contacted in order to get authorisation to film me taking part in the evening racing alongside able bodied sailors. He allowed the filming to take place provided that the shouting on the start line and at the first mark were not shown. I think he was only joking. Anyway, apparently the footage from this was amazing. Wheelchair rugby is another big part of my life, but we thought that it would be good to show me playing alongside my friends. 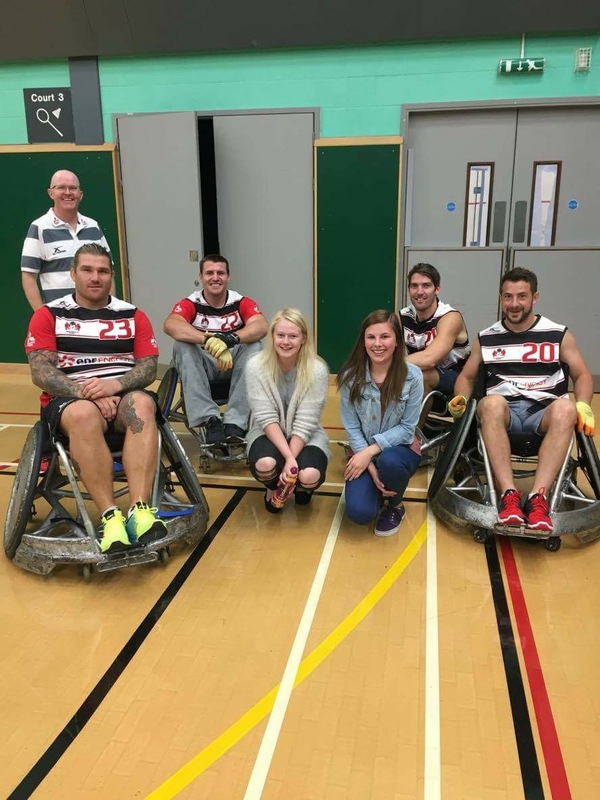 We hired out the Cotswold Leisure Centre sports hall and invited some of my friends, as well as a few members of the Gloucester Wheelchair Rugby Team. The event was filmed, and we even managed to get my daughter Zoe into a chair. That meant a lot to me because I’ve never been able to really do any sports or physical games with her; apart from occasionally getting her to sail with me, this was the first time. She loved it! In fact a week later when we had a game against the Gloucester Rugby ambassadors – James Hook, Richard Hibbard, Greig Laidlaw, and Ben Morgan; she was desperate to get in a chair and play again. Or maybe it was just to get close to 4 hunky rugby players. She’s showing a lot more interest these days; in rugby players that is, not wheelchair rugby. Potential suitors should be warned that I’m a very protective Dad and you won’t get an easy time; it’s probably not worth it. After 11 years of being in the same wheelchair, I had finally got the money together to replace it, using money from the Wheelchair Service, NHS CHC funding, Regain and Aspire charities, as well as my own contribution. 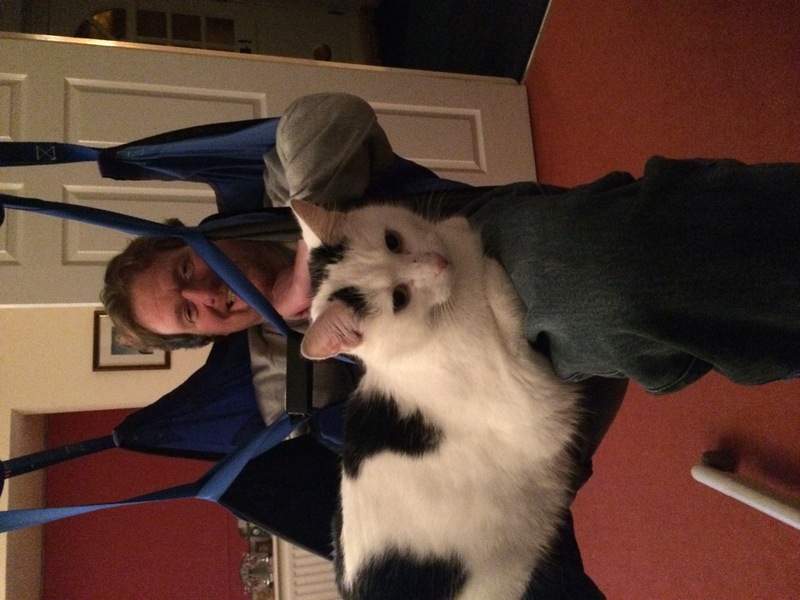 The film crew wanted to come with me to try out my new chair when it was delivered; all the way to Cambridgeshire. Once at Draft wheelchairs, the film crew set up to capture my reaction when it was brought out. For somebody who doesn’t use a wheelchair it is probably hard to imagine why a new chair means so much. Small differences in width, bucket, foot plate positioning, back rest height, sag, angle, caster size, etc; make a huge difference to my comfort, balance, ability to push, ability to transfer, skin, and ability to attach devices to help on rough terrain – the Freewheel. Getting into the chair, it immediately felt better for my posture, and the film crew commented on how it enabled me to sit more upright. It always takes a while to get a chair set up perfectly, but this was a great start. I was very pleased with it. On our pre wedding photo shoot with Marcus from Big Eye Photography, the camera team were there filming the process. This was quite cool, and Marcus built this in to some of the shots. It was also quite useful to get him working with the film crew because they were both going to be filming at the wedding. There were a few times on the day that Marcus had to direct the cameras and sound teams to different places in order to get a clean shot. On the wedding day it was decided that we would have a pre wedding photography session: “the first look”. Being a late wedding in October meant that the light wouldn’t be good, so it was necessary to do a majority of the pictures before the ceremony. For this I would be positioned on the sun terrace at the hotel, and Nicky would come round the corner. The film crew and Marcus would capture the “first look” moment. It was quite a challenge for them to work together to capture both sides of this coming together without getting in each other’s way; whist keeping it natural and genuine. They worked it very well together. Le Beaujolais French restaurant is where we went for our first date and where I proposed. Kiean the Manager; opened the restaurant especially for the team to film us there. He cooked us steak and chips, and treated us to wine. It was incredible, and completely above and beyond. It is a great shame Le Beaujolais has now had to close and I am immensely grateful for Kiean for having us to film. Unfortunately we had lots of filming to do that day, and next was to go to the gym. We had to whizz back home, transfer onto the bed to change into gym kit, and then get back to the gym for more filming. I couldn’t have felt any less like doing exercise at that time. Also on that day the weight machine was a bit glitchy, well that’s my excuse; and I look really pathetic on it. I mentioned before about the difficulties of trying on my Dinner Suit at the Tailors, and how amenable the staff at Brocks were; bringing the trousers to the house for me to get into on the bed. However, for the filming we then had to go to the shop in the centre of town to try on the jacket. This meant going through Cirencester in formal wear at 11am with a film crew drawing attention to me. I generally feel quite conspicuous in public, not that it bothers me anymore, but this did feel quite bizarre. People must have been curious about what was going on. The morning walk (wheel) of shame from a big night out? They also filmed Nicky going out for a pre wedding catch up with her friends and bridesmaids, so they decided to go for a meal in town. A few had arrived quite early, and started to get into the spirit of things in the afternoon while we were still filming. The sound man wired up all the girls so that they could capture everything that was said. In town they were filmed crossing the road towards the hotel, and were discussing what they’d like to do to the sound man; these were all mature married women! Apparently Ash is an attractive, desirable young man. He now knows this because he heard every word. This made all that material completely unusable. On the wedding day itself, there was a film crew with Nicky while she was getting ready at the hotel, and another team with me and the best men at home. Cammy interviewed me in the morning before we left; the questions that she asked really made me think about what the wedding meant. I don’t think that I would have thought about this in the same way otherwise because I would have been too preoccupied getting ready. This combined with a beautifully written card from Nicky made me very emotional. I didn’t think that I was a hugely emotional person, but I was really struggling to speak at some points during the interview. A quite funny section was filming Darryl and Charlie wrestling with me to put my jacket on. They’d never done this before, and seemed to think that since I’m paralysed my arms would now move in non-human ways. We went to the hotel and after talking to some of the early arrivers, I was taken to the sun terrace by the lake for some photographs, and to set up the cameras to film our “First look”. It seemed like a lifetime waiting for Nicky and the bridesmaids. Eventually there was a bustle of activity and excitement, so I knew that she was on her way. The TV crew had to quickly get into a new position so that they weren’t in our special wedding photos. As she came round the corner I got quite choked, she looked beautiful, and she burst into tears. I think tears of happiness; as I say I’m not brilliant at reading emotion. Some of the photo shoot was filmed, but we then had an opportunity to be together with just Marcus for our wedding photos. He found some great locations to frame the pictures. The film crew set up in the marquee for the ceremony. Amazingly, with the number of people involved and all the equipment, it was really unobtrusive. Charlotte had to say something at the start of the ceremony to inform our guests about what was going on, and to ask if anybody did not want to be filmed. But apart from that, the ceremony went ahead as usual. It was very emotional, and I think I also caught members of the production team in tears. I must admit that there was a moment where I was worried that Nicky wasn’t going to make it down the aisle; she got overwhelmed at the entrance, and her brother Chris had to calm her down and regain composure. Nicky had a sound box in her garter, so this moment is captured beautifully. After the ceremony we had drinks, and photographs were taken of the bridal party. This was all filmed as well. Charlotte took the opportunity to interview us again to find out how we were feeling now that we were married. I remember saying that I wished I’d been able to say my promises more clearly, but emotion had taken over and I could barely speak. The speeches took place before the wedding breakfast (never understood why it’s a breakfast?). We did this because the band needed time to set up afterwards; and so that we could relax for the meal without worrying about what was to come. Our speeches were also filmed, and this of course became another teary moment; I’ve never leaked so much in my life. Nicky had everybody in tears again, especially Zoe who literally wailed at one point. It was actually really nice to know how much it meant to her too. I decided to take a more humorous approach to the speeches, revealing the profile that Nicky had posted on Match.com. The filming continued on until after the first dance, which almost ended up with both of us on the floor, but we were rescued. It was nice that after this the production team could let their hair down and be part of the celebrations. bespoke wedding stationery, cirencester weddings, cotswold weddings, disabled, disabled dating, disabled weddings, extraordinary weddings, four pillars hotel, Gloucester Rugby, sailability, wedding planning, weddings, wheelchair rugby. Bookmark. Loved being part of your filming at Le Beaujolais and loved watching the finished result last night! Nicola and David God bless you both. Your story is inspiring. True love does exist. This is just a great story of the both of you David and Nicky. Still inspire me and was great to be involved with the filming of the Wheelchair Rugby, although not shown on the TV itself it was a great insight into what they do to bring together these sort of TV productions.